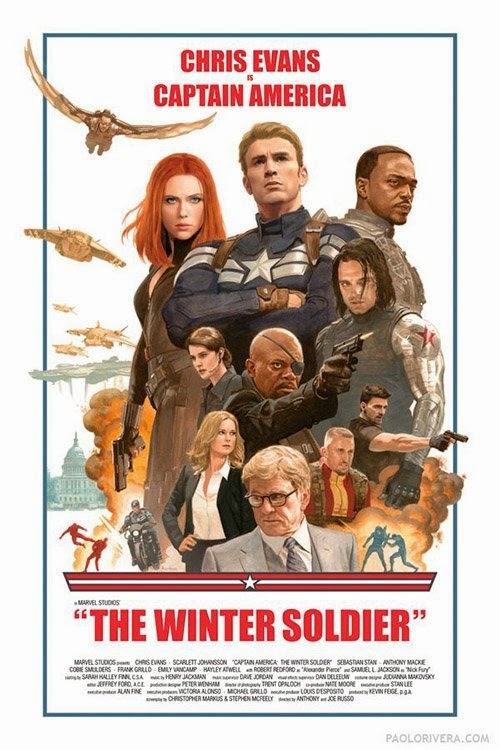 After a day to think about it, I can safely say that The Winter Soldier has elevated itself to perhaps my favourite movie from the Marvel Cinematic Universe, a full rung above the Avengers. Which is pretty neat as the first Captain America movie was pretty meh. Coupled with the fact that the godawful Iron Man 3 and incredibly meh Thor 2 has me worried on whether MCU is a sustainable franchise. Good thing they got it with Captain America 2. While CGI heavy in places, The Winter Soldier feels like a much more realistic movie thanks to some brilliant Bourne franchise-style fighting choreography and use of heavy artillery and proper weapons (lasers, who needs them?). Captain America has learned some new modern fighting movies and some of his take downs are pretty epic. I could watch Cap destroying that plane after escaping the Triskelion on repeat. It isn't always dark and moody like those Bourne and crappy new James Bond movies though. The film is laced with wit and perfectly timed comic relief (watch out for that one referencing Samuel L Jackson's character in Pulp Fiction), as you would expect from a MCU movie. Nick Fury's car A.I. also gives Jarvis a run for his money in the funny department. Chris Evans has improved on his acting range, but it is still a relief to find that he doesn't have to carry the film entirely on his soldiers. Robert Redford, king of political dramas, appears in a large role as S.H.I.E.D. head honcho. Speaking of Redford's Alexander Pierce, well those theories about his role you have read on the internet - they could be true. Scarlett Johansson has also seen her Natasha Romanoff character expanded, which can only be a good thing if we are ever going to see a solo Black Widow movie enter production. Finally, Anthony Mackie brought get characterisation to the Falcon character, and here's hoping we will see more adventures between him and the Captain. Even more exciting, we get to see how the Marvel Cinematic Universe's expansion of villains like Crossbones, because if there is one thing we need in MCU, it is some proper villains. Loki can't always be relied on. I will stop now before my desire to ruining things for you. What I will tell you is I will be watching this movie again, this time in the appropriate format in a proper cinema. If you had any doubts, cast them aside. This is a great superhero/spy/conspiracy movie. And don't forget to stay for the two post credit scenes (age of miracles, yikes! ).